Sometimes a soccer field holds more than the promise of an upcoming match. For Houston nonprofit reVision, the green space is ground zero for transformative change. “Soccer is the most powerful tool for kids that I have ever seen,” CEO Charles Rotramel said. Rotramel is a pastor at St. Luke’s UMC, Gethsemane in Houston. The sport builds teamwork and forces cooperation, he added. Unlike other sports, where an individual takes the spotlight, in soccer everyone works together like a well-oiled machine. “When it’s working, it’s like creating art,” Rotramel said. 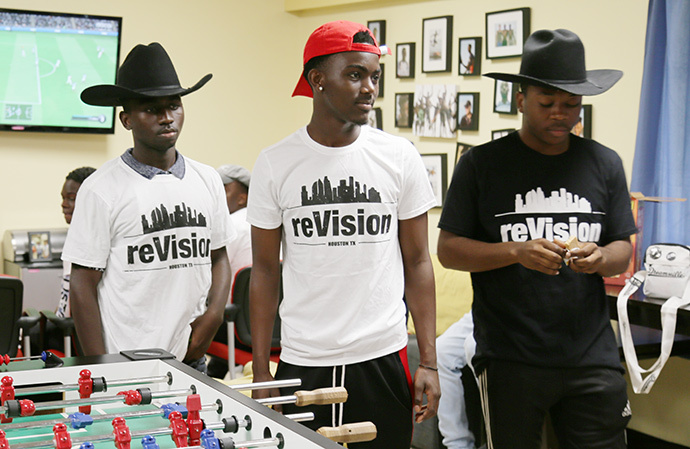 “It’s an art that everyone makes together, a whole group participates in creating.” Before helping found reVision, Rotramel created the nonprofit Youth Advocates Inc, spending 15 years helping youth thrive. During that time, he began coaching soccer teams. “They didn’t have a way to play, because they didn’t have the money to join a group,” he said. In 2007, Rotramel started a team, eliminating the costs and giving students a chance to compete at a higher level. He coached four teams and they won three state championships. After 10 years, Rotramel threw in his coaching hat and thought his soccer days were over. He was on a new mission – starting reVision. The nonprofit began when St. Luke’s UMC created a committee to serve youth affected by gang activity in the Gulfton and Sharpstown neighborhoods. By 2013, reVision expanded its work to schools, joining United Way of Greater Houston to build a mentorship program in Spring Branch ISD. Recently, HISD got on board to add more opportunities to schools. The nonprofit is centered on faith – and the power of churches to drum up volunteer mentors. When students were identified as entering the Juvenile Detention system, reVision would reach out to a church in that area to see if they would help. “We mapped churches by zip codes to see if we could get them interested in what we’re doing,” Rotramel said. Now, more than 33 churches are involved, about 400 volunteers helping about 1,100 youth each year. The organization helps all types of youth who become isolated or disconnected, who are treated as outsiders, Rotramel said. “Whether that’s because of the juvenile justice system, school, discrimination, being a refugee or immigrant, dealing with foster care or lack of family guidance, there are a lot of reasons kids get disconnected,” he added. ReVision does not seek to change those students, he explained. “You don’t need them to have a different story, you just need a revision,” he said. “We need to see the kids differently. We also want to reimagine Houston as a place where kids matter.” That requires meeting students where they are, Rotramel explained. Sometimes that’s in juvenile detention. It turned out that a lot of students were on the soccer field, reVision soon learned. Rotramel, who thought his coaching days were over, found out that he was wrong. He also saw a level of violence in their neighborhoods, gangs taking over their apartments. Shootings were commonplace, even in the daytime. 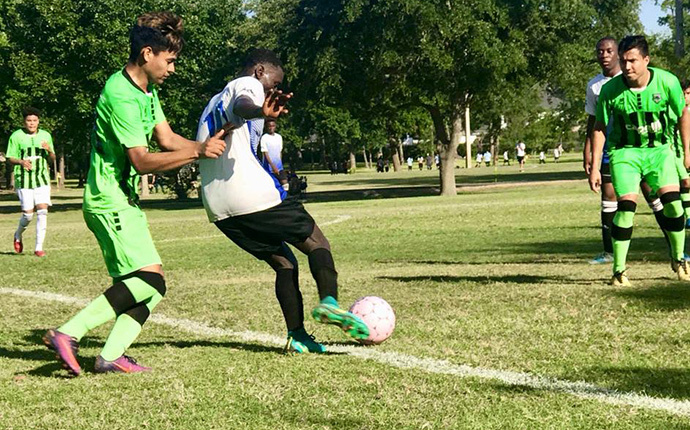 In the spring of 2017, the prowess of these refugee students on the field was undeniable. Rotramel called a friend from the Houston Dynamo Academy and asked him to check them out. “Tell me if I’m crazy or are they really good?” Rotramel remembers asking. 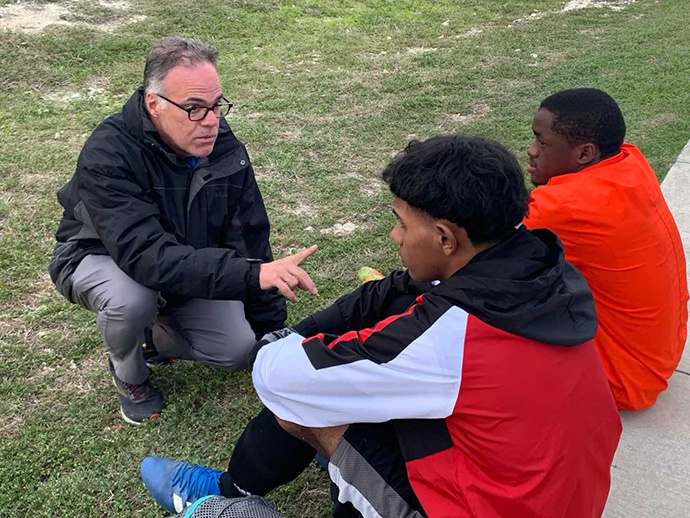 “After 60 seconds, he said, ‘Oh yeah, these kids are amazing.’” The following Sunday, Rotramel asked the players to sit down and consider making a big decision – should they become a competitive team? “How can you start a team this late in the game?” Rotramel even asked himself. “It’s a crazy project. A lot of the guys were seniors in high school. Our kids are starting to play at 18, while most kids are playing at 8. They had never played competitive soccer at this level.” But they wanted to try. Rotramel created a crash course, teaching them everything he knew. By Memorial Day weekend in 2017, they had their first game. It took a while for them to win, but the players were determined and eventually they did. By the fall of 2017, they made it to division one in the Dynamo/Dash League. Then, they qualified for the National Presidents Cup competition for US Youth Soccer – and won the state championship. This season, while a few teammates graduated high school and went on to college, the rest are still competing. They’re currently 9-1 and seating third in the state. 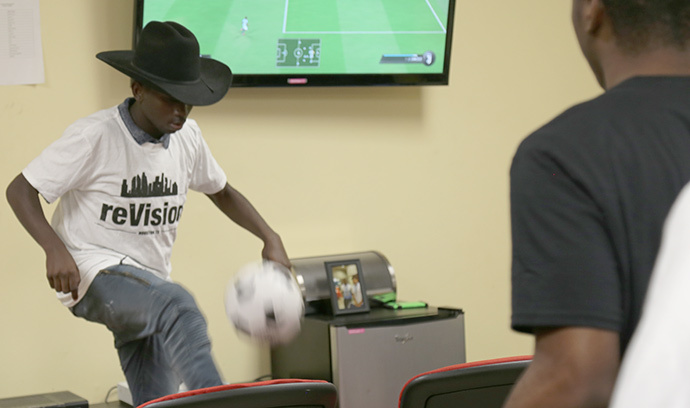 The refugee students from Africa enjoyed listening to country music – and watching the bull riders. Because of their life experience, Rotramel explained that a number of students lost their family members to violence. Some live with extended family or friends to escape disasters in their home countries. “We’re building a family here, and you can feel it,” Rotramel said. “Having new experiences together, like going to the rodeo, is invaluable. We’re not trying to change kids; we’re getting to know them. We’re building relationships.” In that process, they’re also building a vision – a new idea of what a community can be.